Ace Pilot page 2 is here and is read for your eyeballs! 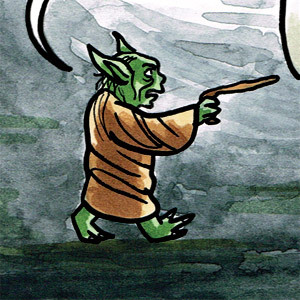 The autobio saga continues to unfold, as Halloween costumes and Yoda are deployed (but not Halloween costumes of Yoda, strangely enough). To see all the pages that have been posted so far, click ye here. But what’s all this about a podcast? So yeah, turns out I was interviewed by Queer Words, a podcast that features authors of the LGBTQIA variety, and you can listen to that very podcast now. I’m pretty sure I said some things about queer comics. Finally, I have finished coloring the remastered version of “Medicine; Run,” which I still fully intend to debut at DiNK in a couple of weeks. LOL, no. I still have to clean up the scans, reletter, format for minicomic, and print. Oh, and draw the cover. BUT, the bulk of the work is done. So. Still whittling away, but soon. SOON. Previous post: Ace Pilot commences!